The Marbledale Road Environmental Coalition is a 501(c)(3) nonprofit service organization dedicated to protecting the community from the toxic threats of the Marbledale Road Quarry Dump. We are a volunteer group fighting for a safer community. Your Donation is Tax Deductable. Credit Card Donations are accepted through Pay Pal here. Thank you. Check our Facebook page and events for current events! Over 2,700 local community members signed the Petition for a Full Environmental Impact Statement of the Marriott Springhill Suites Hotel on the Marbledale Road Quarry Hazardous Waste Dump. Our Communities needed to know how the aggressive disturbance of the Hazardous Waste in the Dump would Impact our Air, Water and Environment. Despite over 2,700 community signatures on the Petition, and a Positive Motion by Planning Board Commissioner Melba Caliano for a Full Environmental Impact Statement, Village of Tuckahoe Planning Board Commissioners Claire Gorman, Ann Marie Ciaramella, and Raymond Nerenberg ignored their own community and voted against a Full Environmental Impact Statement. In addition, Chairwoman Ciaramella, Commissioner Claire Gorman, and Commission Raymond Nerenberg did not allow any of the over 200 members of the community who were in the hall, to speak. When the Marriott Springhill Suites Project came up for the vote, Commissioner Melba Caliano cited many specific criteria why the Marriott Springhill Suites Project Proposal on the Marbledale Road Quarry Dump was too vague in to be approved. Commissioner Melba Caliano and Commissioner Barra both voted against the hotel on the dump proposal. The Community filled room applauded them both. Yet, Commissioners Claire Gorman, Ann Marie Ciaramella, and Raymond Nerenberg all approved the hotel on the dump proposal. The Community responded with boos, tears, and words of frustration. Now, we are faced with the dangerous situation of toxic contaminant release into our air and ground water. The Marbledale Road Environmental Coalition is assisting members of the Community in funding an Article 78 Legal Action. The Article 78 seeks to overturn the dangerous and premature decisions that have lead us to this hazardous situation. The legal team has also made a motion for an injunction. Both the Injunction and the Article 78 are currently under review in the court. Please Assist us in Funding the Independent Environmental Experts who are continually advocating for our communities' health, safety and welfare, are assessing all of data that is made available to them. Please Assist us in Funding the legal team who is advocating for our Air and Water in court. Or, you can send a check to: The Marbledale Road Environmental Coalition, P.O.Box 14, Eastchester, NY 10709. Please make the check payable to: The Marbledale Road Environmental Coalition. I) Write Each Individual Member of the Tuckahoe Planning Board and Demand a Full Environmental Impact Statement be required for the Marriott Springhill Suites Development on the Marbledale Road Quarry Dump. Planning Board Members and Trustees names and addresses. The Petition for the EIS has over 2,000 local signatures, and is still growing: listen to your community. A full EIS will Tell us: what the impacts of their activities will be on us in writing. A full EIS will Require: concise descriptions of their actions and activities. A full EIS is the normal protocol for Brownfield sites. A full EIS will answer questions that they still do not answer. A full EIS will answer questions that they do not know. They still have not followed the DEC’s guidelines to Characterize (test) the majority of the site. Currently Only 5 test holes go to 75’, the rest are only at 15’. Less than 10% (in some cases less than 5%) of the soil in each of those boring holes is being tested. They are still refusing to locate buried drums and tanks. Mr. Canovan repeatedly says that they ‘can not test everything’, but, they should, at a minimum, follow the DEC’s guidelines and test the Majority of the 3.43acre, 85’ – 100’ deep site. To much unknown Toxic Waste = DANGER to YOU. C) Current Communications: There is no stipulation any where that Dr. Donald Hughes, P.H.D, PE, the Environmental Consultant for the Community Coalition will be included in any communications once the project is approved. Before September, 2016, Dr. Hughes was not included in the Tuckahoe Village communications. In September, 2016 Dr. Hughes had 2 phone conferences with the Tuckahoe Village Environmental Consultant. D) The Tuckahoe Building Inspector will be the only Local Authority with Jurisdication After Site Plan Approval. The Current Site Plan Approval does not set forth any specific rules or stipulations for the developer to follow in regards to the development project. The Tuckahoe Village Building Inspector will be your only local enforcement for any situation that may affect the community during all of the construction activities.  1) Write to the Tuckahoe Planning Board and request a full Environmental Impact Statement (EIS). The Petition for the EIS has over 2,000 signatures, and is still growing. 2) Write to the Tuckahoe Planning Board and the Department of Environmental Conservation (DEC) and Demand Full and Comprehensive Testing, Evaluation, Assessment and Risk Assessment of the Entire Marbledale Road Quarry Dump BEFORE any Construction and/or Remediation work is started. 3) Write to the Department of Environmental Conservation (DEC) Demand that the Final Remedial Action Work Plan be Revised after the FEIS, Comprehensive Testing, Comprehensive Assessments and Evaluations are completed. 4) Demand that The Mayor of Tuckahoe and the Tuckahoe Board of Trustees Place a Moratorium on all remediation and construction activities until the FEIS, Comprehensive Testing, Comprehensive Assessments and Evaluations are completed. 5) Demand that The Mayor of Tuckahoe and the Tuckahoe Board of Trustees enact Full Transparency of ALL testing, assessments, remediation, construction, schedules, and associated documents. That ALL documents be placed into a public online downloadable site. 6) Demand that The Mayor of Tuckahoe and the Tuckahoe Board of Trustees enact Full Transparency of everything that has occurred, and will occur, in relation to the Tuckahoe Marbledale Road Quarry dump. YOUR TIME TO SPEAK OUT IS NOW & Put it on the record now! Their Legacy’s are at stake. How they protect our communities’ from threats is on the line. The Marbledale Road Quarry Dump is a threat to our Community and must be treated as a threat. Bilwin Developments (the Volunteer) may be using a technique called "dynamic compaction". This technique entails a large weight of 3 - 36 tons, dropped repeatedly from a crane, to purposely send intense vibrations throughout the hazardous waste and ash. The site will be repeatedly hit with the heavy weight. When this occurs, there will be contaminated dust and vapor release. Buried chemical filled drums, containers, and pressurized tanks, when hit with this technique, will breach. Dynamic Compaction will disrupt the hazardous toxic waste. Sudden releases of vapors and dust threatens the health of our community. 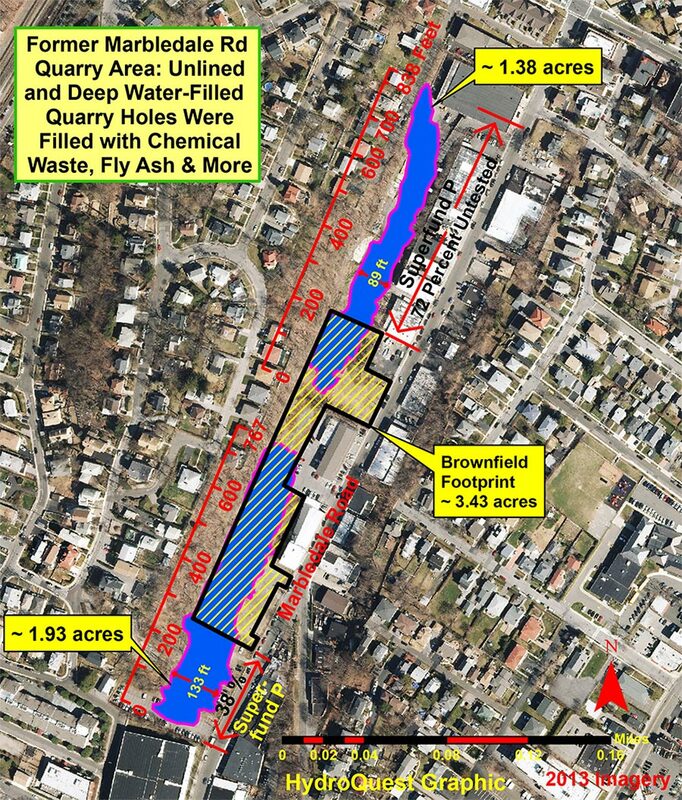 Due to the fact that the hazardous waste, and ash, in the Tuckahoe Marbledale Road Quarry Dump, may not be stable enough to withstand the weight of the finished parking lot, dynamic compaction is the most likely proposed method. This will certainly cause disruptive vibrations in the area. 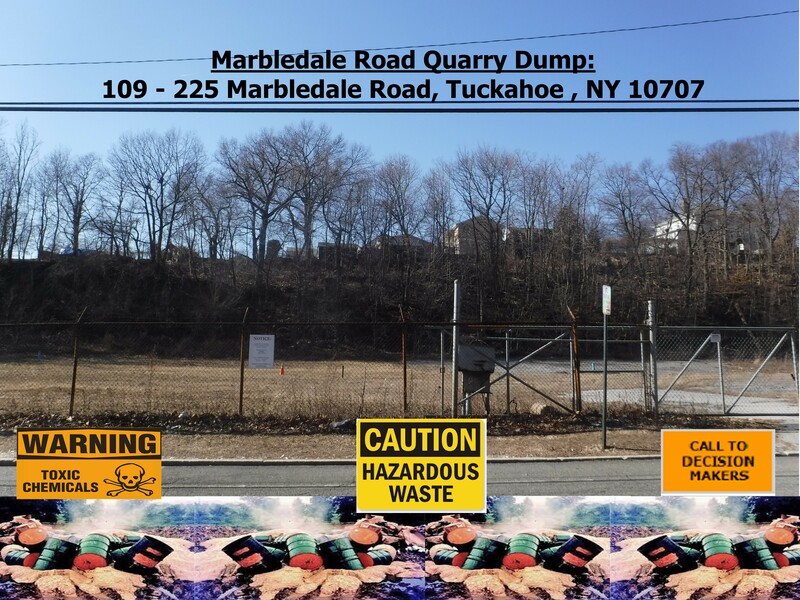 There are more eyewitness of hazardous waste dumping in the Tuckahoe Marbledale Road Quarry Dump. They recall 55-gallon drums, barrels, tanks, transformers, incinerator ash, chemical waste, pharmaceutical waste, and industrial waste. The site was so volatile that it used to spontaneously combust. 1) Demand a Full Environmental Impact Study (FEIS) of the Marriott Springhill Suites Project on the Marbledale Road Quarry Dump. The Petition for the FEIS has over 2,000 signatures! 2) Demand Full and Comprehensive Testing, Evaluation, Assessment and Risk Assessment of the Entire Marbledale Road Quarry Dump BEFORE any Construction and/or Remediation work is started. 3) Demand that the Final Remedial Action Work Plan be Revised after the FEIS, Comprehensive Assessments and Evaluations. 4) Demand that a moratorium be placed on all remediation and construction activities until the complete assessments and evaluations are done. 5) Demand Full Transparency of all testing, assessment, remediation and construction documents: that ALL documents be placed into a public online downloadable site. 6) Demand Full Transparency of everything that has occurred, and will occur, in relation to the Tuckahoe Marbledale Road Quarry dump. 7) Make your Demands at the Meeting & in Writing! Deliver your letters to the Tuckahoe Planning Board before the meeting, and at the meeting! IV) Dr. Donald Hughes: Sept 6, 2016 Comments on the Planned Remediation of the Marbledale Road Quarry Dump. The DEC has confirmed that the Tuckahoe Marbledale Road Quarry Dump is a Hazardous Waste Dump (Class 2(P) & BCP). A Marriott SpringHill Suites hotel is proposed in the middle of this hazardous waste dump. Because of the proposed Marriott hotel project, the center 3.43 acres of the 7 acre toxic dump is in the Brownfield Program (BCP). The DEC has now approved a Remedial Action Work Plan (RAWP), without having done a thorough examination of the BCP site. No testing at all has been done on the surrounding ~3.5 acres of the dump. Any construction on the site will release contaminated vapors and dust. A proper evaluation of the risk has not been performed; therefore the risk posed to our community is unknown. How can any plan be safe if nobody knows the contaminants that are currently coming off of the dump, and what will be stirred up and released during construction? ◆ Test and monitor for dioxin, radioactivity, pharmaceuticals, and other toxic contaminants. KNOWLEDGE IS POWER: COMPLETE, EXTENSIVE TESTING of the ENTIRE DUMP SITE IS NECESSARY TO PROTECT OUR COMMUNITY. Do Not Allow a rush to Development to Take Precedence over the Health and Safety of our Community!! Demand that we have the most sophisticated protections and safety protocols. We need the DEC to enact all of the testing recommendations, and safety protocols put forth by Dr. Donald Hughes. 1) Current Ambient air testing: test the air now. 2) Soil Vapor testing of the entire BCP site, the entire Quarry Dump, and the surrounding buildings. They must identify the specific types of soil vapor contaminants in order to properly protect us. 3) During all construction activities: Specific Soil Vapor monitoring to identify the specific contaminants in the vapors. We need to know our exposure risks. 4) Real time vapor monitoring systems: test in real time what vapors are being released into our air, and at what levels. 5) Real time community alert systems: let us know whenever there have been work stoppages due to contaminated vapor and dust overages in the air. 6) Soil vapor capture systems, during construction, and after the project completion. Capture the vapors, do not vent them into our air. 7) Tenting the area during construction activities; this, with vapor capture, will best protect our community from contaminated vapor and dust exposure. 8) Test for Dioxin, Radioactivity, Pharmaceuticals, and several more contaminants. These contaminants require specific types of community protection protocols. 9) Identify chemical filled drums, tanks, canisters before digging. When a bulldozer hits a ~60 year old chemical filled drum, the drum will probably rupture. And then, the construction crew will have to deal with the exposures and leakages. Encourage the DEC to be pro-active, and more protective of the risks of exposure. 10) A Full Department of Health Risk Assessment of the possible toxic threats to our entire community. We are Pro-Testing & Pro-Safety: because this is where we live. "Dioxin and Dust Hazards of the Marbledale Road Quarry Dump, by Dr. Donald Hughes of Hughes Environmental Consulting, August 8, 2016"
Dr. Donald Hughes, P.E., P.H.D. : an expert in hazardous waste sites, toxic impacts on the environment, and P.H.D. in chemistry. Mr. Paul Rubin, Hydroquest: Expert in hydro-geology, and hazardous waste sites. Mr. David Gordon, Esq. : Environmental Attorney, formally of River Keepers. Our experts are the only experts who have assessed and advocated for the most protective public safety protocols. Our experts are the only experts whose only directive is the health, safety and welfare of the community. Our experts are the only experts who have looked at all of the data, all available historical data, and all available witness accounts. Our experts are the only experts who are currently assessing all of the contaminated vapor data. Our Experts are actively assessing the data, the work plans, awaiting outstanding data and making recommendations for testing, monitoring, safety protocols and work protocols in regards to toxic waste in the Marbledale Road Quarry Dump. Our goal is to continue funding expert assessment, recommendations and oversight. All funds will be completely dedicated to the experts, and keeping our communities fully informed. Our experts are the only experts who are not compromised by a rush to development. Our experts’ only directive is the health, safety & welfare of the public. The Marbledale Road Environmental Coalition is self-funded by your local community members. Contribute today and help us keep fighting for a safer community. To Protect the Health, Safety and Welfare of Tuckahoe, Eastchester, Bronxville, Yonkers, Mt. Vernon, and the surrounding communities, a Full Environmental Impact Study must be done, before any remediation or construction plan can be properly formulated. Please Join us in requesting that the Village of Tuckahoe Planning Board rescind the Conditional Negative Declaration, and Approve a Full Environmental Impact Study of Marbledale Road Quarry Dump and the Marriott Springhill Suites project. Thank you for Taking Action and Protecting your Community! Please Sign the Waverly Elementary School Petition Letter! Please protect our children and our community. We are writing again to ask for more testing and safety measures be put in place. Simply fill in your information, and the letter automatically emails to a number of elected officials. Information is critial! Enter your email address to join our newsletter. We only sent out critical updates regarding this issue, and your email address will never be shared with any other group or organization. If you are willing to volunteer your time to help out, please check the volunteer box. Anything you can do will be helpful and greatly appreciated! Join our email list to get updates on Events and Actions! 1) Succeeded in having the DEC designate the northern and southern portions of the Marbledale Road Quarry Dump as a Site 2 (P) – Inactive Hazardous Waste Site. Before we got involved, the DEC did not even recognize that the northern and southern portions of the dump existed. 2) Succeeded in the DEC adding more ground water monitoring during the on-site construction activities. This is a good first step, but the DEC still needs to test the water off of the Brownfield site. Nobody will know for sure how the contaminants are migrating in the groundwater until the off-site ground water is tested. 4) Succeeded in outreach and alerting some of our community to the threats of the Marbledale Road Quarry Hazardous Waste Dump. 5) Succeeded in the DEC doing heavy metal testing of the onsite ground water. The testing results showed heavy metal contamination of the ground water. 6) Succeeded in having the DEC do vapor testing of 2 commercial buildings. Both buildings returned with very high levels of PCE and TCE vapors underneath the buildings. Our ask is so simple: More Testing, so that the best safety plan can be formulated. More Safety Protocols, so that our community can be best protected. NO remediation or construction plan should be started until the entire Quarry Dump is comprehensively investigated, tested and understood. How can any plan protect us if they do not know what is in the dump? Testing by the developer's consultant, and the DEC, shows the presence of highly toxic chemicals within the proposed site for the Marriott Springfield Suites hotel. The hotel site is now considered a significant threat to public health by the Department of Health. Based on these same tests, the remaining areas of the dump are now designated a Superfund Site [Class 2P-Inactive Hazardous Waste Site]. Why should a hotel be built in the middle of a hazardous waste site full of unknown dangers? The rest of the Quarry Dump, north and south of the hotel project site, has never been tested. Contaminated vapors will be released into our air during construction and remediation. The completed Marriott project will vent the vapors into our air forever. Testing confirms that the groundwater on the Marriott site is highly contaminated. Contaminated groundwater can give off toxic vapors. The groundwater flows to the Bronx River. Disturbing the contents of the dump, during construction, and remediation, could release dangerous chemicals into our environment. The DEC has acknowledged the presence of buried drums and tanks on the site. The Quarry Waste Dump was never meant to be a landfill. It does not have any barriers along the sides, the bottom, or the top. Contaminants can migrate out of the dump as vapor and in the groundwater. Our independent experts' only directive is to protect the health, safety and welfare of the public. They have reviewed all of the data and strongly advise further testing and improved safety protocols. Northern and Southern portions of the Dump have never been tested. Northern and Southern areas are now in the D.E.C. Super Fund - Inactive Hazardous Waste Site Program under the "P" designation. BLUE: Represents former quarry pits. The quarry pits, and the surrounding areas, were filled with hazardous, toxid industrial and pharmaceutical wastes, barrels, and contaminants. Eastchester Resident Talks About The Flaws In The Plan.August 8, 2016 - Tuckahoe Board Meeting.Experienced structural engineer questions the safety of Hotel Construction activities on the Marbledale Quarry Dump. Where Is The Safety Plan For Marbledale Road Quarry Dump Construction? Resident Mary Anna speaking at the Town of Eastchester Board Meeting on August 16, 2016. The DEC and Bilwin Development Affiliates lack safety plans in case of an emergency. She had many other concerns because of her experience living near another SuperFund site on the Gowanus Canal in Brooklyn, NY. Has Bilwin Development Affiliates, LLC Ever Developed A Toxic.Site? No, it has not. These are questions at the Town of Eastchester Board Meeting on August 16th. What other toxic sites has the developer been involved with? Is this his first one? We are a volunteer Group dedicated to protecting the community from the toxic threats of the Marbledale Road Quarry Dump. Please check back often to get the most recent updates including petitions, downloads, and a chance to make a difference!